Finally...a chance to wear a piece of history with these MLB Authenticated Game Used Baseball Sterling Silver Pendants. Sterling Silver ball chain necklace included - choose 16" or 18" length! 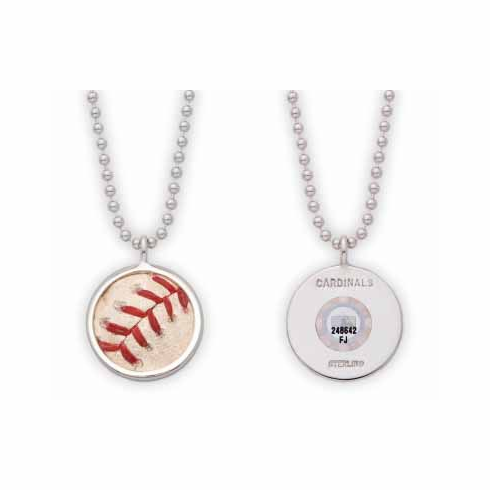 The baseball used to create these unique pendants is made from an MLB Authenticated game-used baseball used by your favorite Major League Baseball team! Measures appx. 7/8" in diameter and the back is hallmarked with the team and/or event. These are perfect for collectors and baseball fans alike. Best of all, you can even look up which game your ball was used in by entering the hologram number on the back of the pendant at mlb.com/authentication.